When: Tuesday and Wednesday afternoons for the rest of the golf season. Play either day or both days to increase your chances of winning. You may play anytime after 12:00 pm. *First match will be Tuesday September 25, 2018.
into the pro shop. There is no obligation or commitments. Format: Each day (Tuesday and Wednesday) will be its own match. The player with the lowest net score will win a $25.00 club credit. The player with the 5th lowest net score will win a $20.00 club credit. 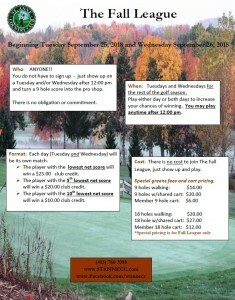 The player with the 10th lowest net score will win a $10.00 club credit. play. Special greens fees and cart pricing.